Step 2. Select Edit then specify the Segment ID pool then click OK. Note: The range must be between 5000 and 16777216, meaning over 16 million segments can be used! As of now, I believe VMware only supports 10,000 due to a DVS limitation but I am sure this will increase as updates come out. 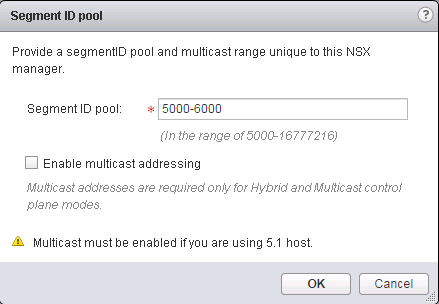 Also, if you are on a 5.1 host, remember you had to configure multicast for the control plane mode, meaning, you need to select Enable Multicast Addressing on this screen.